Toddler Approved! : Spring Has Sprung! We are excited about all the flowers that are blooming around our house... and then falling and covering our lawn like snowflakes. If I could plant something new in our front yard I'd love to plant some tulips. We came up with this art project today when my son insisted that we do a "project" and wanted to paint dots. Here is how we made our Polka Dot Tulips! Materials Needed: paper plate, paint & paintbrushes (or Dotters), piece of white cardstock, piece of pastel colored cardstock, scissors, glue stick, green markers, and a Sharpie. 1. Turn your paper plate over and have your toddler paint the back of the plate. We liked using lots of color... and had to cover two plates instead of just one. 2. While the plate dries, have your toddler use green paint and green markers to cover the white piece of cardstock. 3. Draw a tulip or flower with a Sharpie on the front of the paper plate (non-paint side). Then use scissors to cut out the flower tops. We went through several drafts/attempts to draw these. My husband just laughed at my first attempts... said they looked spikey heads. This was the best that I could do today without a pattern. 4. Cut out leaves and stems from the green painted white piece of cardstock. 5. Use a Sharpie to draw the outline of the flower, leaf, and stem onto another piece of pastel cardstock. This outline will help your child when he is positioning the parts (leaves, flowers, stem) and make it kind of like a puzzle. 6. Have your toddler cover the back of the pieces with glue and stick them to the outline on the pastel piece of paper. 7. Hang your flowers where you can see them often and get even more excited that spring has arrived! - Talk about the parts of the flowers- stems, leaves, petals, etc. The older the child, the more information you can share. 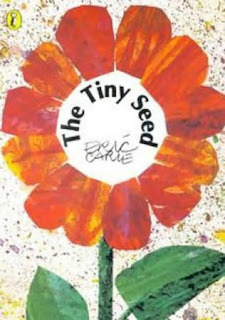 - Read the book The Tiny Seed by Eric Carle and talk about how flowers grow from seeds. - Help your toddler plant a seed in a pot, water the seed, and watch it grow. Talking about this process with your child and doing the physical actions will help solidify the new vocabulary words you try and teach them (grow, plant, water, dig, dirt, bury, seed, sprout, etc.). 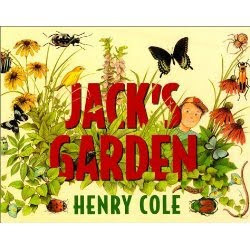 Jack's Garden by Henry Cole- This book is a take-off on the rhyme "This is the house that Jack built" and tells all about a little boy's experience in the garden growing flowers. I love the pictures and the use of the familiar rhyme! 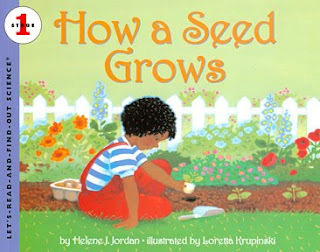 How a Seed Grows by Helene J. Jordan- I loved using this book with my students because it is very simple, doesn't have too much language, and has basic pictures that show how a seed grows. This turned out super cute!! Need a project for my subbing tomorrow and this is perfect! Thank you so much for sharing and for the book list as well.